MessageLabs is a leading worldwide provider of integrated messaging and web security services. Founded by Star Technology Services, this vibrant company provides a range of managed security services to protect, control, encrypt, and archive communications across Email, Web, and Instant Messaging, competing with some of the largest IT companies in the world. Establishing brand presence and building a strong customer base was key to growth, using a network of partners and resellers enabled rapid growth, but how to ensure that those key partners and resellers were fully supported? Developing a range of supporting collateral that could be dual branded for all partners / resellers to access was an important step in building strong relationships. We worked closely with the marketing department within MessageLabs and created a full suite of dual branded marketing collateral, ranging from on and off-line. We also worked with the HR department to ensure that all staff were sold the MessageLabs ‘vision’, providing employee folders, brochures and giveaways to all new starters. 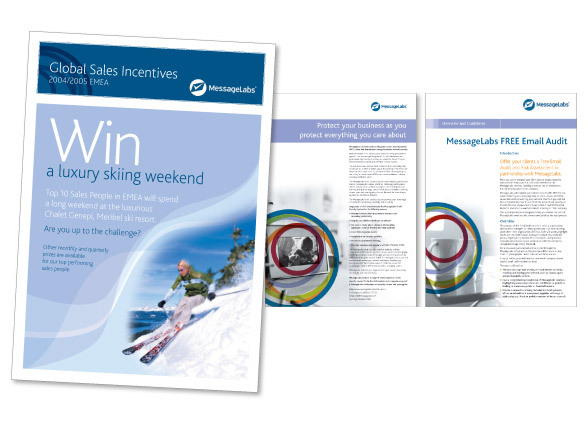 Sales campaigns were also supported by us, creating graphics for sales incentive programs, with weekly emails to keep staff updated. MessageLabs continue to lead the way within the industry and have built a strong brand, competing successfully with companies such as Google, Microsoft and McAfee. The partner and reseller network continues to deliver and retain new business and sales growth remains healthy.